Jalebi is a popular Indian Sweet, made using maida, sugar and ghee as the ingredient. I have tasted it in many occasions, but never tried it at home. Once i have helped a friend when she did with the instant jalebi mix. 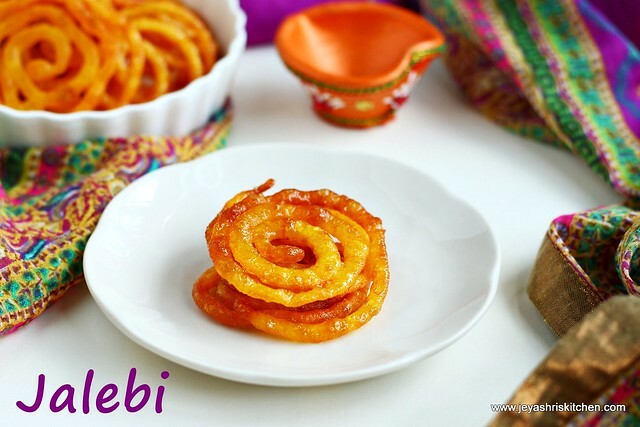 When i get requests to post Jalebi recipe for Diwali, i explored for recipes and finally ended up with this recipe here. It was a super hit at home and everyone loved it. Though in the original recipe it is not mentioned to ferment, many chefs insisted about the fermentation of the batter. So i fermented the batter and it came out very well. 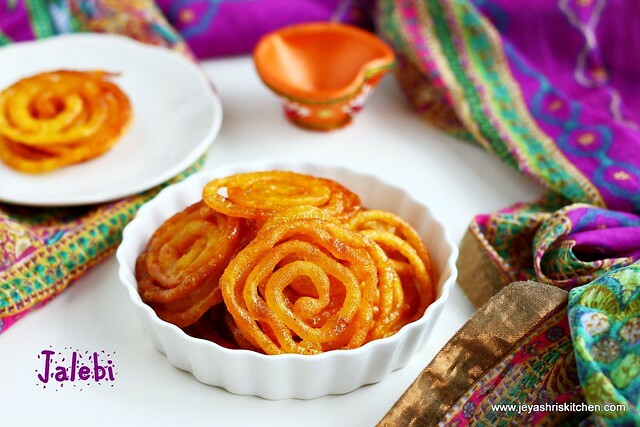 So make this Jalebi for diwali 2015 and surprise your family with a delicious sweet. Check my diwali recipe collection. Follow Jeyashri's kitchen on facebook for recent updates. In a bowl add the maida, rice flour, baking powder and sieve it. Sieving is for proper mixing. Add yogurt and food colour to this. Mix this well without any lumps. Add water if needed to bring it to a idli batter consistency. Beat this well with the back of the spoon in a same circular motion for 5 minutes. This brings in nice aeration to the batter. Keep it covered and let it sit for 12 hours. I made it by 10 pm in the night and made it at 11 am the next day. Next day once the batter is fermented, Just mix it with the spoon. Do not over mix. We need the fermented batter to keep it air pockets in batter. So do not mix too much once it is fermented. Pour it into a zip lock cover or a ketchup bottle. If you ask me ketchup bottle works out perfect. Somehow, i couldn't handle ziplock cover and so i transferred it to a ketchup bottle which i got from a friend long back. Add sugar and water in a pan. Boil till it reaches one string consistency. Add lemon juice and rose essence to this. If adding saffron you can add now. Heat oil in a flat pan and once it becomes hot , keep it in a low flame. Gently squeeze the batter into the oil by putting 3 circles. Cook till they become crisp and it changes it colour. Take it out from the oil and transfer it to the sugar syrup. Keep it for 1 minute and take it out. Arrange it in a plate and serve hot. Jalebis will be awesome when they are served hot. Garnish with pistachio and serve hot. Jalebis will be awesome when they are served with rabdis. Jalebi batter will be perfect to fry once they are fermented. If you feel it is too loose after you put them into oil, add 1 tblsp of rice flour or corn flour to it and mix well. Always fry the jalebi in medium low flame. Else they will get burnt soon and will not be crisp. The batter consistency should be like a thick idli batter consistency. I got my batter fermented well after 12 hours, if you feel it is not fermented keep it in a warm place for few more hours. Do not add cooking soda(sodium bicarbonate). I tried adding in the last batch and it was a total flop. The jalebis turned out very thin and started breaking. Ensure that the jalebis are crisp after frying. else it wont taste nice. You fry in ghee too if you want. 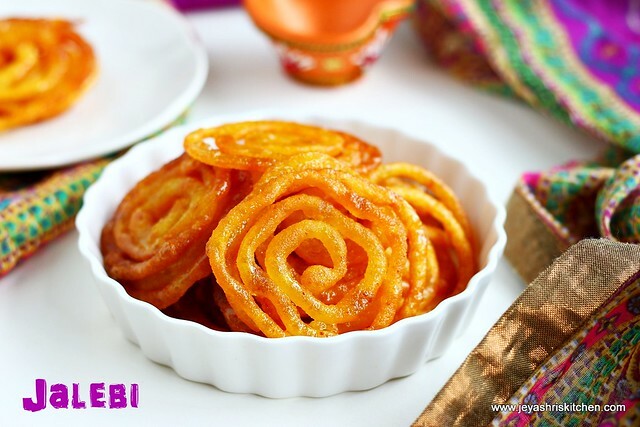 Jey crispy and addictive Jalebi! Happy Diwali! Can i make it one day in advance and serve on diwali?Will it be good to eat? Yes you can. Better keep in the refrigerator and warm in microwave before serving.